PreK, Kindergarten and 1st Grade learn about the difference between fiction and nonfiction books. 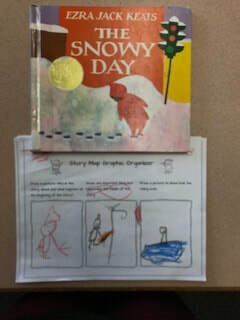 A Frankencrayon to go with our fictional crayon story with the same title. First Grade practice using a mouse and navigating on a computer, opening and closing window, and resizing images to fit on a page. 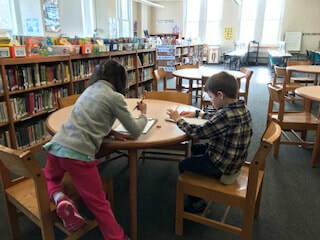 Book Doctors are in demand so second grade students demonstrate knowledge of the do's and don't for caring for books. Mrs. Richardson's class finished their study on the author Jan Brett. Our last book was The Mitten. Students recalled the order the animals went into the mitten making a collage of animals. First grade learned about biographies and then took turns interviewing a classmate. Students will write an illustrate a short biography page about their classmate. 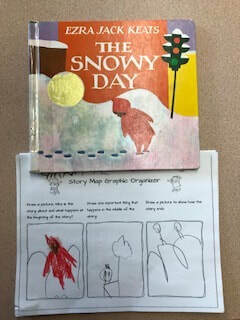 Kindergarten discussed characters and used pictures to describe action in the beginning, middle, and end of a story.